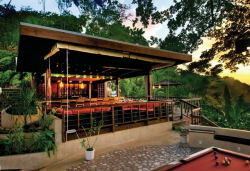 Feast on bespoke local and international cuisine, and in particular a unique brand of Jamaican-Japanese fusion fare, which blends home-style West Indian spices with cutting-edge Japanese recipes. 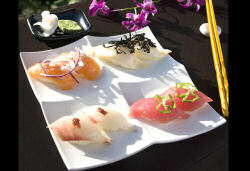 Exotically mouthwatering sushi and sashimi combinations make this type of dining a new adventure in culinary alchemy. The in-house pastry chef prepares a daily selection of croissants, danish, and elemental breads to breakfast on. A traditional continental menu is available, as well as a variety of Jamaican starters, including steamed dumplings, ackee and salt fish, plantains and seasonal fruits and garden-fresh vegetables. All meals are served with a selection of teas, cappuccino and freshly squeezed fruit juices. A full bar is available for lunch and dinner. As an added convenience, Sanwood features its own dining facility where guests can make selections from an a la carte menu from the Bushbar. Alternatively, Sanwood's chefs are available to prepare Jamaican home-style cuisine exclusively for the residents of Sanwood villa. Meals are served in the lushly exquisite Bushbar, complete with an ambient sound system, outdoor pool table and a forest-to-ocean view that expands the boundaries of even the most vivid imagination. It features a Teppanyaki grill, on which savory meat, fish and vegetable Hibachi-style stir-fry dishes are made-to-order before your very eyes! Considered its own art form in Japan, this style of preparation adds a level of transcultural flair to the already globally infused kitchen. Service A highly trained team of individuals is ready to cater to your every whim in a subtle, friendly and unobtrusive manner. In keeping with the Island Outpost philosophy, guests are treated first and foremost like family.